For some reason, I decided I'd like some patchwork in silk. I took a large piece of silk, used one of my great grandmother's transfer and added lots of french knots and web stitches. Before I'd finished, it got put away while I did something else, and then I forgot about it. I found it last week when I was looking for a particular hoop, and thought I'd better get some more work done on it. I finished all the stitching, and then up it went for damp stretching. 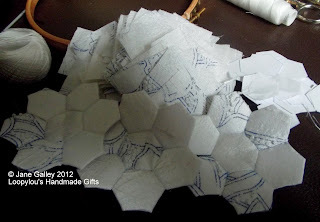 I then forgot to take a photo, but when it was ready, it got cut up and I'm now making hexagon flowers. Each of these hexagons measure half an inch! It's tiny, but I love it. This will definitely take a while. Lovely and the silk has a beautiful texture. That is one ambitious project! Looks gorgeous. Did you invent the idea? I love hexies but not that small. Oh my , aren't you adventurous now! Inspirational post dear! I love making hexies, but have never made the smaller ones. these are beautiful! ...but it will be so worth it. I think I love that you are incorporating something that belonged to your grandmother into something so challenging. I'm looking forward to seeing it completed.